Choco (ちょこ, Choco) is an SSB4 Zero Suit Samus player from Tokyo, Japan, and is currently considered the best Zero Suit Samus player in the country, and among the best in the world. 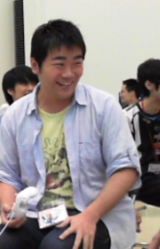 He is currently ranked 3rd on the JAPAN Power Rankings and 35th on the ‎Panda Global Rankings 100. He has taken sets off of top players such as Dabuz, Larry Lurr, VoiD, KEN, Abadango, komorikiri, Kirihara, ESAM, Kameme, and Nietono. In SSBB, he was considered one of the best Zero Suit Samus players in the world, along with Salem and V115. The editor who added this tag elaborates: Way more Brawl results than this. Choco is the first player to have made the Panda Global Rankings Top 50 without attending a U.S. tournament for the season he ranked in. He is also the only player to achieve this in multiple PGR seasons, doing so for seasons 3-5. This page was last edited on April 14, 2019, at 04:03.